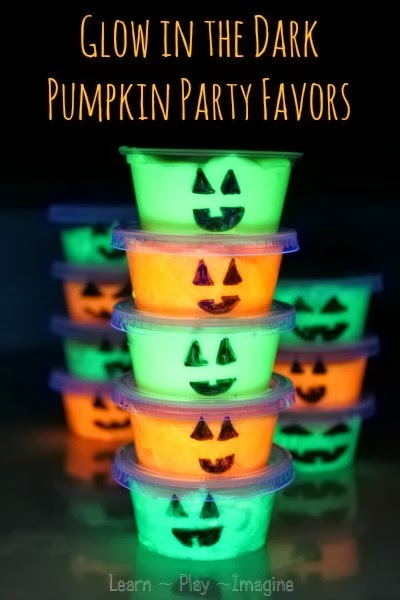 Simple to make glow in the dark slime pumpkin party favors. Halloween is rapidly approaching! You know what that means? Candy! I'm fine with my kids having treats here and there, but I really don't need them overloading. It seems like everywhere you turn there are pumpkin cupcakes, pumpkin pie, Halloween cookies, and yummy fall drinks loaded with sugar. Wouldn't it be nice to give kids sugar free party favors instead of more treats? We love making slime, so I decided to make glow in the dark slime to give away as party favors. This pumpkin slime is really the perfect non edible treat for kids. It's so much fun! Directions: Our two ingredient slime recipe is so simple. I learned when making rainbow sand slime that all you have to do to make this slime recipe is combine equal parts of glue and liquid starch, and let the ingredients sit for a few minutes. To add color, or in this case glow, mix the paint with the liquid starch before adding to the glue. This helps the color mix more evenly. If you aren't making glow in the dark slime but want to add color to your slime you can mix food coloring or liquid watercolor paint to the starch instead. I don't measure when I make slime. The recipe is very forgiving. I just eye it until I think I have even amounts of liquid starch and glue. This batch of slime was made using white school glue. Clear glue works very well and would probably glow a bit stronger. I had white glue on hand at the time, so I stuck with the white. After the slime sits for about 5-10 minutes roll it around in your hands. If it is too sticky add more starch. If it is too slimy add more glue. While all different consistencies of slime are a whole lot of fun, I suggest making sure the slime isn't too sticky when handing it out as party favors. The slime can be played with immediately. In fact, when my boys want to make a new batch of slime they generally do all of the mixing by hand instead of leaving it to sit. Either way is fine. Leaving it is the easy, no fuss way to make slime. For these party favors since I needed big batches of slime to make a lot of favors I let it sit. After it sat for ten or so minutes I mixed each color with my hands and formed a big ball. Then I left each batch in a container uncovered overnight. You don't want to leave the slime uncovered too long, but letting it air out overnight helps it to become more rubbery. I suggest making the slime at least a couple days in advance, so it has time to dry out a bit. Next I drew little Jack O'Lanters on the jello shot containers. I let the containers air dry a bit to avoid smearing the black ink. Then I filled each container with the glow in the dark slime. Please note: Glow in the dark paint needs to be recharged under a light source to glow. I took these photos using a black light, so I could get good photos. A black light is not required to make the pumpkin slime party favors glow, however it won't glow quite as brightly as pictured. I tried to get a good photo of the glow without a black light, but my camera would not corporate. I suggest letting each guest know that the slime needs to be recharged in order to glow and that any slimy residue can be easily cleaned with warm water. Regular slime, even without the glow, would be an awesome party favor any time of year. It's kind of like a little ball of silly putty. *Liquid starch contains borax, so these party favors are best for children three and up, or children who no longer put everything in their mouth. I always have my boys wash their hands with soap and warm water after playing with slime. For more slime recipes for fall follow me on Pinterest. How long does this stay moist? I have a party coming up and would like to make it in advance if I can! Thank you for your help! You can make it in advance for sure. I've had batches of slime last for several months. I've found that white glue lasts longer than clear glue. I tried this last night. I can't get the two to mix. The starch seems to stay runny. Did you mix it for a long time? It takes awhile for the two ingredients to do their magic. Sometimes I leave it overnight to mix on its own. Hello Alison! Is there any way to substitute the liquid starch! I can't find one :( Thank you! My daughter will love these!!! !